CCCC is reviewing its strategic statements and as we do, I’m doing my best to be faithful to our Christian identity and leave room for God to speak into the process. Over a couple of posts I will lay out a review process which I hope you will find fresh, stimulating and effective. 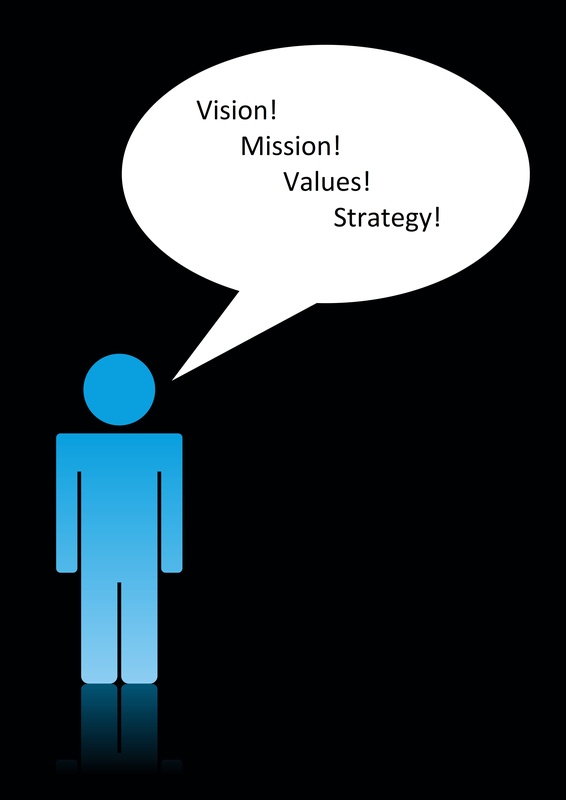 Every organization has a core ideology (its vision, mission and values) that is the underpinning for everything that it does. This ideology is the driving force that inspires and propels the organization forward. Vision explains why the organization exists (what it wants to accomplish), mission is its overarching strategy for accomplishing the vision, and values are the rules it lives by. A hypothetical example will show the difference between vision and mission. Two ministries might have the same vision: Local churches thriving under excellent leadership, but have very different missions because they have different strategies to grow excellent leadership. One mission might to be provide excellent seminary training while the other ministry might be to provide coaching services or to publish church leadership books. Three other items should be part of the strategic statement package: the Tagline, the Value Proposition and the Key Success Indicators. The tagline is a three to five word phrase that clearly positions your ministry for your audience. It is what you want to be known for and evokes the first thought or feeling you want people to have when they hear your ministry’s name. provides focus for strategy development. The value proposition for a local church might answer the question, “With so many churches in your town, why should there be another one?” For an independent agency, it could answer the question, “Why not merge with another ministry and save the duplicated overhead costs?” Perhaps your methodology is different, or you have a denominational distinctive in theology or culture you want to maintain. Perhaps it is the mix of what you do that is valuable. People writing about strategy and marketing use the term ‘unique value proposition,’ but I’m not keen on using unique in a ministry environment where every church has the same mission and every other ministry is working on some part of that same mission. I do, however, think you should be very clear about your ministry’s contribution to the church’s mission. What makes you stand out from the crowd? The value proposition needs to be defined before the programs are designed because it should have a key influence in designing your strategic initiatives and programs. The success indicators need to be defined early in the strategic review because they will be used later to assess the effectiveness of your current strategies and programs. In this regard, be especially careful that success indicators are set based on the strategic statements alone, because only the strategic statements define organizational success. You must fight the tendency to define success in terms of your programs. The source of a Christian ministry’s core ideology is the revelation of God through Scripture and the guidance of the Holy Spirit. The Bible provides the context for all Christian ministry, so you must know it very well. At least a few senior leaders on your team should have some formal theological education. Scripture lays out the ideal future that God is leading us towards, the values he wants us to have, and the character traits that should guide us in all our work and relationships. Some aspects of the ideal kingdom life may have more relevance to your mission than others, just as some values and traits may be more central to your mission than others. So feel free to highlight those and make them prominent in the life and work of your ministry. For example, God’s love for all humanity, his concern for the poor, or what he views as proper worship could each have greater significance in a ministry devoted to one of those issues. Perhaps you have been quite isolationist as a ministry and you want to take special care to be more relational in the future. Highlight that. 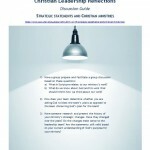 As you go through your strategic planning process, keep asking, “What in Scripture relates to this? What do we know about God and his work that should inform how we think about this?” These questions need to permeate every aspect of the strategy review process. guides us as we make decisions so that we can work faithfully as God’s agents. It is critical that you are willing to be led by the Spirit, and are not just bringing your plans to God for his blessing. If you don’t give the Spirit time to lead you, all you have is what the human mind can conceive. I learned years ago that my mind is no match for God’s. Give God space by practising the Christian disciplines of silence and solitude. A great book to help you do this is Space for God . God has a specific purpose for your ministry, and to discern what it is I suggest that you consult with the directors and staff whom God has called to serve in your ministry, not just in the present, but in the past as well. Churches should also consult with their members. Tradition may be defined as an extension of the [voting] franchise. Tradition means giving votes to the most obscure of all classes, our ancestors. It is the democracy of the dead. Tradition refuses to submit to the small and arrogant oligarchy of those who merely happen to be walking about. All democrats object to men being disqualified by the accident of birth; tradition objects to their being disqualified by the accident of death. Democracy tells us not to neglect a good man’s opinion, even if he is our groom; tradition asks us not to neglect a good man’s opinion, even if he is our father. I, at any rate, cannot separate the two ideas of democracy and tradition; it seems evident to me that they are the same idea. We will have the dead at our councils. While the present board and staff can make strategic changes, they are not free to do so without due respect to the past. Are the old strategies outdated? Has the mission been accomplished? Are there new aspects to the mission that didn’t exist before? By all means, make the necessary changes, but don’t just arbitrarily think that you know better than your predecessors. That would be chronological arrogance! To fully understand God’s purpose for your ministry today, do a chronological review of the strategic statements to see if there is a trajectory that ties them together. Is there an overarching common vision? Talk with the people who led the ministry over the years (if they are still available to you) or read their plans and other documents. If there is a trajectory, look carefully at what changed between the versions and look for underlying trends. Perhaps there is movement from crisis intervention (shelters, food banks, etc.) to advocacy for systemic change to prevent poverty in the first place. Maybe your congregation is expanding its view of what church is all about. Most ministries will show some development over the years. Try extending the trajectory forward to see where your ministry is headed. Is this where you want to be? Special attention must be given to the people whom God has placed in senior leadership because they acted in the capacity of stewards of the ministry and its mission, and presumably were placed in the senior leadership role by God for a reason. Each may have contributed to a different understanding of the mission while also adhering to the core ideology. At this point, keep your focus on the strategic statements and leave their strategies and programs, which are secondary and tertiary matters, for later. In part two of this post I will give you specific practices and questions to help you discern your strategic statements.